Powerful, emotive and critically acclaimed traditional Irish music group from the west of Ireland, the Alan Kelly Gang have established themselves as one of Ireland’s leading contemporary trad’ acts. 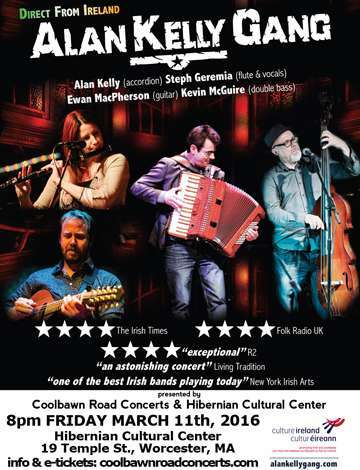 Roscommon native, Alan Kelly has long been declared Ireland’s innovative piano accordion maestro and not only described by New York’s Irish Voice as ‘in league with the best piano accordionists in the world’ but also credited with ‘making the piano accordion hip in Ireland again’ (Folk Roots). He is joined by, acclaimed New York singer and flautist, Steph Geremia, virtuoso bassist, Kevin McGuire and inventive guitarist, Ewan MacPherson. Each a highly respected artist in their own right, they blend instinctively to create a sound with depth, groove and musicality of the highest order. The sheer energy and variation in repertoire that they infuse into their live performance has set them apart from the mold and won them accolades from critic and music lover alike. Though firmly rooted in Irish tradition, they seamlessly introduce Galician, Breton, Scottish and Americana influences. To date, they have toured and performed across the globe at top world music festivals including: WOMADelaide (Australia), Edmonton Folk Festival (Canada), Celtic Connections (Scotland) and many more. 2015 has welcomed the release of their 2nd band album, The Last Bell to wide critical acclaim. Individually they have worked with people including: De Dannan, Lúnasa, The Cheiftains, Carlos Nunez, Arty McGlynn, Michael McGoldrick, Karen Casey and Alison Brown. They have also gained popularity in recent years through their collaborative work with Scottish songstress, Eddi Reader and Trashcan Sinatra’s guitarist and songwriter, John Douglas. With strong dynamics, driving rhythms and buoyant harmonies, skillfully executed and soulfully delivered, their music will draw even the most fainthearted listener into the passion that they put into the music they play and keep one coming back for more! Most definitely “a drive and energy that will keep the chill out of the coldest winter night” (Folk Radio UK). For more information contact Bud Sargent at (508) 868-7552 or bud.sargent@gmail.com or Helen Foley at 508-799-7775 htfoley@charter.net.